Loving Loving Loving this album. A dirty funky Al Green. Syl & Al. Did they develop vocals styles so similar each on their own? Was one totally influenced by the other? 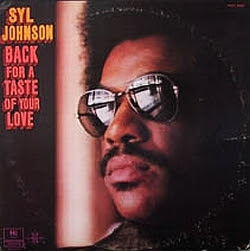 Of course, like most people, I heard Al first, but I love the bluesy unpretentiousness of Syl. "Back for a Taste" is great stuff, but have you heard "Total Explosion"? Might be even better. Thx for this post man! Good post here! I have always loved the Hi Records rhythms.